Discover three of Australia’s must-sees in style on this ten-day trip, starting in the fabulous city of Sydney before heading to the Red Centre to see Uluru and a final blissful few days on a remote island surrounded by the Great Barrier Reef. Begin with three nights under the iconic skyline of Sydney, a wonderfully vibrant and welcoming city that is the perfect introduction to Australia. Here, you’ll cruise through the harbour aboard a private motorboat for the best views of the Opera House and bridge before dipping your toes in the waters of Bondi Beach. You’ll also venture into the spectacular Blue Mountains behind the city and meet some of the country’s favourite animals at a wildlife sanctuary. Next, fly to very middle of the country, a deeply spiritual and wild place, for two nights of luxury in the shadow of red Uluru. 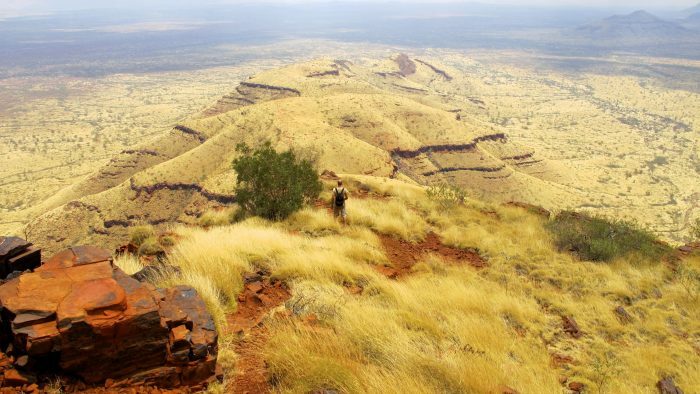 You’ll get to hike through the bush, dine on celebrated cuisine and Australian wine, discover cave paintings and gain an insight into the cultural significance of this vivid landscape. You’ll then head to Silky Oaks and spend three nights exploring the Daintree Rainforest and the turquoise waters of the Great Barrier Reef. Snorkel among schools of fish and appreciate this majestic natural phenomenon from the air with an epic helicopter ride over the waters. With its perfect location in the heart of the city, the Four Seasons offers fantastic panoramas and proximity to landmark attractions such as the Sydney Harbour Bridge and the Sydney Opera House. Rooms and suites are decorated in contemporary grand-luxe style, with big windows that look out over the Sydney skyline. In the larger suites, guests are treated to full harbour views that show the city in all its glory. Enjoy contemporary Australian cuisine at Mode Kitchen and Bar where locally-sourced produce is served in a relaxed bistro-style environment. Head to the Grain for craft beers, organic wine and a selection of expertly mixed cocktails. After a day of exploring, relax and unwind at the hotel spa or take a dip in the outdoor pool. For those who like to stay active on holiday, there is a fitness centre with the latest equipment while the sauna and Jacuzzi act as soothing tonics. The Four Seasons is close to Sydney’s vibrant shopping districts as well as operating as the ideal spot from which to begin your adventures in the surrounding Port Jackson region. The Park Hyatt is found in the historic district of The Rocks with views of the iconic Opera House and Sydney Harbour Bridge. Interiors are modern with a contemporary and clean design. Rooms have a neutral colour scheme of chocolate and cream, naturally-textured fabrics and soft lighting ensures rooms are bright and calm. Specially commissioned paintings and artwork from prominent Australian artists adorn the walls. At the Dining Room, the hotel’s signature restaurant, diners are treated to spectacular vistas of the harbour while enjoying a French-inspired menu. The Living Room has a more relaxed atmosphere while The Bar is a stylish location in which to enjoy fine wine, cocktails and live music. For those looking to relax and let go, indulge in a treatment at the spa or take a dip in the waters of the rooftop pool after working out at the fitness centre. The beautiful port city of Sydney plays host to the luxury Shangri-La Hotel located in the historic Rocks district. The rooms are both contemporary in design and spacious in size, soundproof windows ensuring you get the perfect night’s sleep. Guests are treated to breathtaking panoramas, views covering both the iconic Sydney Opera House as well as the vast expanse of the Harbour Bridge. After a day of exploring the city, nothing beats coming back and sitting down for a bite to eat at the world-class Altitude Restaurant. Floor-to-ceiling windows provide a beautiful backdrop as you enjoy contemporary Australian cuisine and world-class wines. The Café Mix offers all-day dining with a menu of Asian classics with a twist. For some of best views of the city, head to Blu Bar on 36 where the sparkling lights of Darling Harbour, Sydney Harbour Bridge and the Opera House are laid out before you. The health and wellness centre provides you with everything you need to unwind. Sink into the Jacuzzi, indulge in a treatment at the spa, take a dip in the indoor pool or stick to your usual routine in the full-equipped gym. Located in the historic district of The Rocks, Pier One is right at the heart of what makes the city so special. Built on, and over, the harbour it allows guests to experience the very best of the bustling waterfront. The 189 rooms at the Pier One carry a contemporary aesthetic, tastefully complemented by early 20th-century Federation elements. Some look out over landmark sites including the Harbour Bridge and Opera House, while others offer views of Walsh Bay. All rooms and suites are bright and spacious, large windows flooding the spaces with natural light. The Gantry enjoys a reputation as one of the most popular waterside restaurants and here you can relax and enjoy views of Walsh Bay and the harbour while sampling a menu of fresh, seasonal and locally sourced ingredients. To sooth sore muscles after a day of exploring, Pier One offers spa treatments in the comfort of your room. Massages, scrubs and facials await while the gym lets you carry on with your fitness routine. Spicers Potts Point is an intimate boutique hotel on a picturesque avenue in the affluent central suburb of Potts Point. Created from three handsome Victorian terrace houses, airy, light-filled interiors and artworks by Australian artists Martine Emdur and Keith Burt create a calm, welcoming space. The 16 rooms and four suits are all luxuriously appointed, some featuring their own terrace areas, with rain showers, Bose sound systems and modern fittings. Breakfast can be taken in the garden room and while there’s no restaurant here, after evening cocktail and canapés at the bar, you can head out into Potts Point to discover some of Sydney’s best restaurants and cafés. The Royal Botanical Gardens, The Art Gallery of NSW, Circular Quay and the Sydney Opera House are all also close by. The hotel has also partnered with several local restaurants if you are after in-room dining, and complimentary gym and yoga facilities are just a 50 metre walk away. The city of Sydney on the east coast of Australia is as idyllic is it appears from its instantly recognisable cityscape. It boasts a rich and intriguing history, famous beaches and iconic landmarks, with a diverse and friendly population, all spread around an elaborate shoreline of Port Jackson’s yacht-filled inlets, bays and rivers. Pubs, markets, modern restaurants, theatres and galleries old and new add an exciting, sophisticated cultural air, while the fine weather and surrounding natural wonders of New South Wales make it a very outdoorsy place, and a great base from which to explore nearby beaches, mountains and national parks. 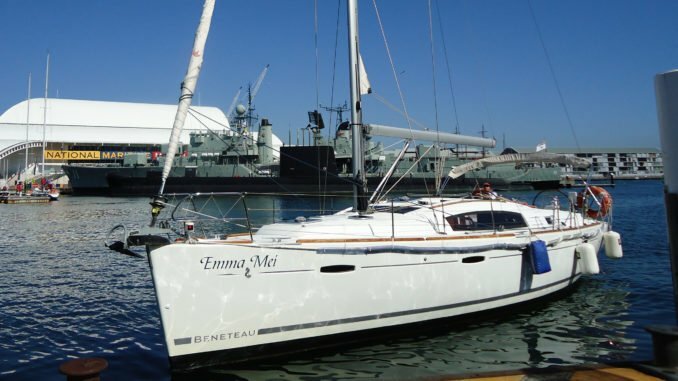 Enjoy sailing through one of the most beautiful harbours in the world aboard the Emma Mei yacht. 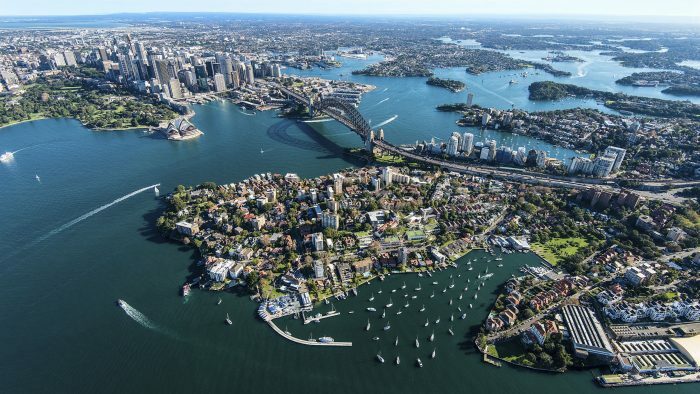 Your skipper will guide you through Sydney’s intriguing history, explaining all about the city's waters, luxury homes, leafy parks, beaches and iconic landmarks. After leaving behind the hustle and bustle of the Sydney, stop at a wildlife park to meet some of Australia’s most iconic wildlife, arriving early to beat the crowds. Continue your journey into the Blue Mountains and walk through spectacular scenery. 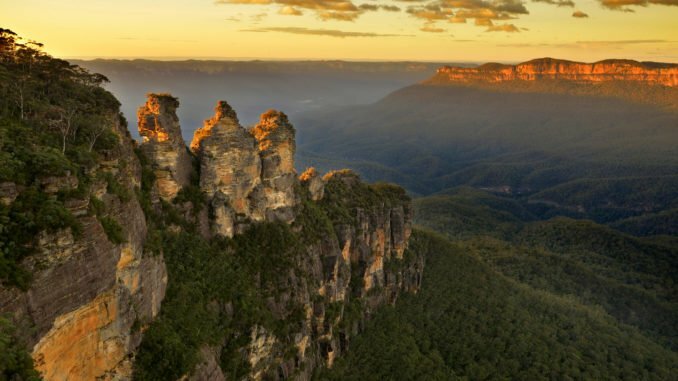 See the famous ‘three sisters’, take a stroll around Katoomba and visit our pick of the best remote lookouts before lunch. Sails in the Desert is a luxury sanctuary of hospitality found near the iconic and sacred greatness of Uluru. The great sandstone dome rises in the distance from the arid beauty of what many refer to as the Red Centre. The 228 rooms are all excellent examples of modern luxury with patterned décor influenced by the natural surroundings and Aboriginal culture. A few open onto shaded outdoor spaces beneath the iconic sails of the resort while others enjoy their own private balconies The menu of Ilkari means you will begin or end your day with a gourmet treat to delight the taste buds. The kitchen is well-versed in providing a myriad of culinary options, from fish barbeques to cured meats to sumptuous soups. The Pira Pool Bar is lovely for a relaxing drink while the Walpa Lobby Bar has a varied and comprehensive gastronomic offering. There is a huge focus on the cultural and spiritual significance of the world-famous nearby landmark. The Mulgara Gallery is dedicated to displaying its amazing collection of artworks and craft pieces while there are a couple of examples of cave art at Uluru. Explore this vast wilderness filled with stories, myths and legends. Golden sunsets illuminate rivers that course through great canyons, arrow-straight road vanish into the heat haze on the horizon, with the immense landscape dotted with national parks and spiritual landmarks, none more recognisable than Uluru, a towering red monolith in the heart of the Northern Territory. The 'Sounds of Silence' dinner under the stars is a magical desert experience. Your journey begins on a lone sand dune where a meandering path takes you to an uninterrupted view of this vast landscape. In front of you is the fabled Uluru; behind you are the domes of Kata Tjuta. Enjoy sparkling wine and a selection of canapés as the sun sets. 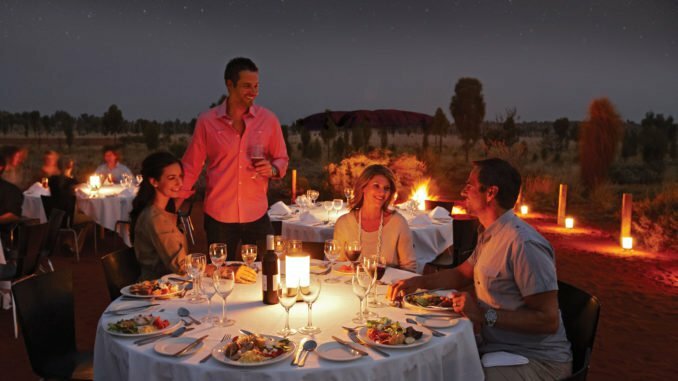 As the stars appear, dine on a barbecue buffet of Australian flavours including barramundi, kangaroo, emu, crocodile and bush salads complemented by some of Australia's finest wines. Attention then turns to some of the world's best stargazing, as the resident astronomer takes you on a tour of the spectacular southern night sky. Revel in the early morning serenity of a truly spiritual place as the sunrise colours change on Kata Tjuta. 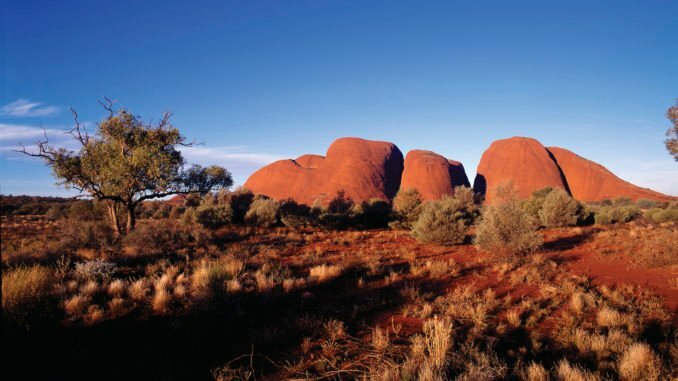 Learn about this diverse environment whilst walking between the mighty conglomerate rock walls into Walpa Gorge and hearing how the 36 domes that make up Kata Tjuta have evolved over millions of years. Take time to listen to the wind (Walpa) far above and view the scale of the rock walls that surround you. The spirituality of this amazing location embraces everyone who ventures here. After a sell-out success in 2016, the award-winning Field of Light, a global phenomenon by internationally acclaimed artist Bruce Munro, has been extended for another season, until 31 December 2020. As darkness falls and Uluru is thrown into silhouette, field of light illuminates. As far as the eye can see gentle rhythms of colour light up the desert. The exhibition, aptly named Tili Wiru Tjuta Nyakutjaku or ‘looking at lots of beautiful lights’ in local Pitjantjatjara is Munro’s largest work to date, with more than 50,000 slender stems crowned with radiant frosted-glass spheres over an area the size of seven football fields. Pathways draw viewers into the installation, which comes to life under a sky brilliant with stars. Silky Oaks is one of Australia’s most stunning riverside lodges, nestled in tropical North Queensland rainforest with a collection of treehouse suites immersing guests in the lush surroundings. The eco-retreat invites you to escape from everyday life and get back in touch with nature amongst the Daintree rainforest setting. 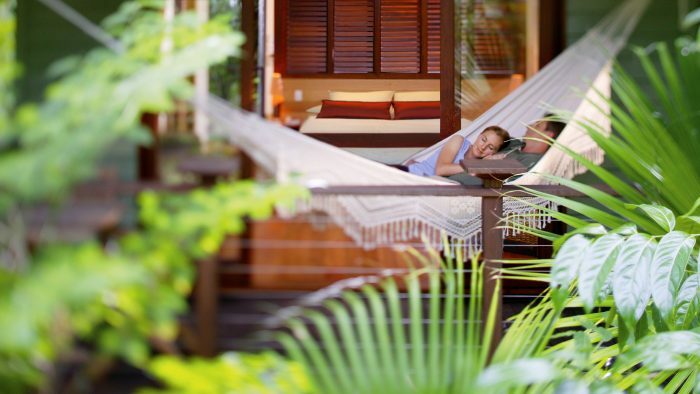 The treehouses and suites blend organic wooden furnishings with contemporary design. Each room has a wide verandah with hammocks, breakfast with a view and deep baths to sink into at the end of the day. Dining at Silky Oaks is a memorable experience, with gourmet Australian cuisine served in the award-winning open-sided Treehouse Restaurant which is perched high above the rainforest and Mossman River. Guests can soak up the tranquil environment from the comfort of the spacious open lounge areas, bar, reading rooms or enter a state of dreamy bliss at the Healing Waters Spa. Guests can explore this diverse and dense rainforest by its many hiking trails, cruise down the river in a canoe, take out a bicycle to venture further afield, go goanna spotting, get zen with morning yoga or cool off in the scenic river. Alternatively, you can simply soak up the tranquil environment from the comfort of the spacious open lounge areas, bar, reading rooms or enter a state of dreamy bliss at the Healing Waters Spa. 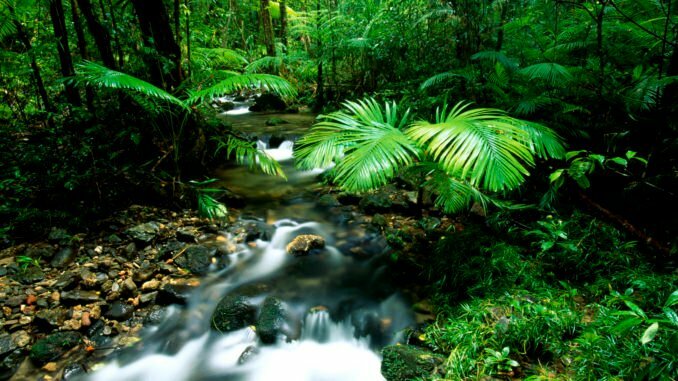 Explore the beautiful surroundings of the Daintree rainforest from the comfort of Silky Oaks. Take a relaxing stroll along the lush riverbank, explore the local area by bike, paddle a canoe or snorkel the Mossman River, join a guided rainforest walk or play tennis. Whichever pursuit you choose, indulge at the end with a relaxing treatment at the Healing Waters Spa. The journey to the Daintree and Cape Tribulation features incredible coastal and rainforest scenery. The Silky Oaks Lodge safari is a full-day tour that visits a variety of different environments including estuary, mangroves, rainforest and beach. The first stop is Mill Walk in Cape Tribulation National Park, a private track accessed exclusively by Silky Oaks Lodge. Away from the crowds, marvel at the ancient rainforest surrounds and learn about the ecology and fauna from your expert naturalist guide. After a short drive, you will arrive at Myall Beach where a relaxing stroll offers spectacular views of the Cape Tribulation and the Great Dividing Range. Then travel to a private bush camp for a traditional Australian BBQ lunch followed by a revitalising swim in a freshwater swimming hole. In the afternoon enjoy a crocodile and wildlife spotting tour on the picturesque Daintree River and return to Silky Oaks Lodge for afternoon tea in the open sided treehouse restaurant. 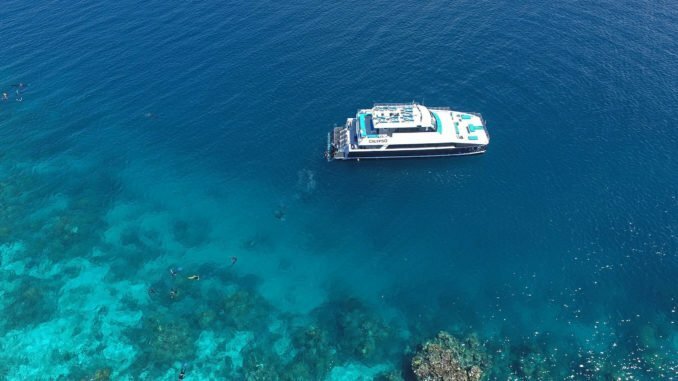 Depart Port Douglas Marina for a day on the Great Barrier Reef. The skipper selects threes sites according to tidal and weather conditions and during the course of the day you have the opportunity to snorkel on the reef - one of the richest habitats on the planet in terms of its diversity. To date more than 400 types of coral, 1500 species of fish and 4000 mollusc species have been recorded. A marine naturalist gives an informative talk and leads the guided snorkel tour. 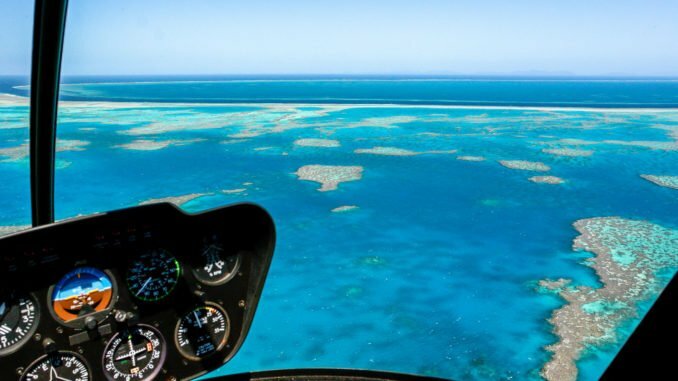 The Great Barrier Reef is a wonder of the world and this helicopter flight lets you appreciate its beauty from above. Your pilot and guide knows this region well and will share stories on the major landmarks throughout your journey. Highlights include Fitzroy Island, Outer Great Barrier Reef, Michaelmas and Upolo Cay, Palm Cove, Kuranda and Cairns. Taking off from Cairns you will head south-west over Trinity Inlet and the Aboriginal community of Yarrabah, to fly over Fitzroy Island. The protected island itself is 339 hectares, with some towering mountain peaks. Its vegetation is mixture of coastal mangroves and open woodlands. From Fitzroy head north-west, towards the Outer Great Barrier Reef. Depending on the time of year, you may see some Humpback Whales which migrate to the waters below during the winter months. Beneath you the Coral Sea is interspersed with just some of the Great Barrier’s over 2,700 individual reefs. The water depth varies from 30m to 5m and you can often see right through to the ocean floor. We'll get in touch within 24 hours and work with you to perfect the details of your trip.